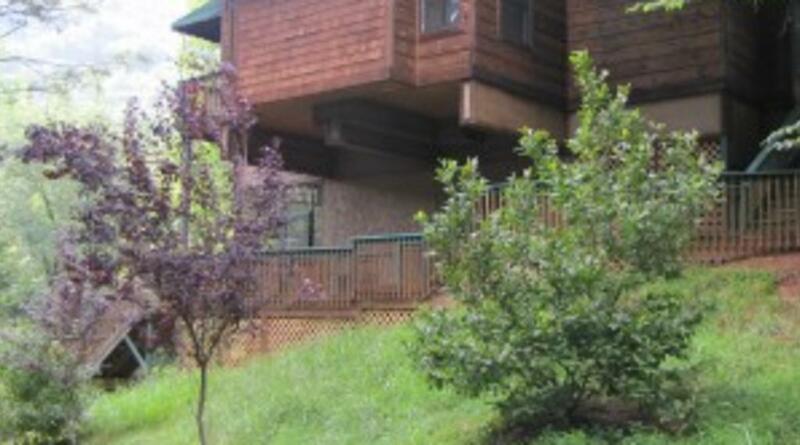 Creekside Cabin is a charming log home that creates a warm, inviting atmosphere and is perched on a beautiful lot, with deck views and access to the bold running Buffalo Creek. The sound of the creek is sure to relax you on the screened in porch. It may even cause a short nap. A fully equipped kitchen includes all you’ll need for cooking a favorite family dinner or a simple pot luck affair. Dining area seats 6 comfortably. The breakfast bar seats 2. The deck just off the dining area provides the gas grill for the Grill Master of the group. Stretch out on the comfy sofa and chairs in the bright open living room that offers a perfect way to enjoy the flat screen TV with Direct TV, wireless internet, DVD, Sony Play Station, movies, or the selection of books provided in the homes collection. There are also games for the children to stay busy with. The gas log fireplace adds to the charm. The main level features Guest Bedroom with queen bed, closet, and ceiling fan. A full bath is just outside this room off the hallway. Washer and Dryer are opposite the bath. The Master Bedroom boasts King bed, flat screen TV, ceiling fan, sliding doors to balcony, walk in closet, and private full bath with dual sinks. Upper level Loft provides a place for the kids. 2 sets of Bunk beds, ceiling fan, and a table for playing board games and cards. Also you will find a full bath with closet. The lower level provides a Foosball table, futon for extra sleeping needs, and full bath, shower only. Off this area is a screened in porch to enjoy all the sights and sounds. This is the book reading or nap place on the cushioned bench. Dining alfresco will be a hit too. 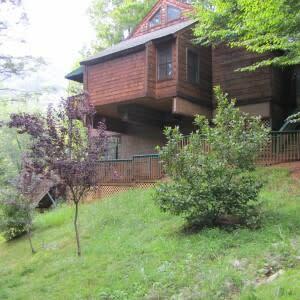 From the porch is access to the steps leading down to the running creek. Guess how many steps there are before setting out. Best guess chooses dinner and does NO dishes. Star gaze in the evening, they’re everywhere! This home is ideal for those seeking solitude, and cozy comfort. Guest passes allow you access to Rumbling Bald amenities which features two championship 18 hole golf courses (nominal fee), indoor/outdoor swimming pools, a marina, salon, fitness center, casual grills, paddle boat/canoe/kayak rentals, tennis, miniature golf, and more! Restaurants are close by both within the resort or in town. There is also a great private sand beach for relaxing. Nice guided pontoon boat tours of Lake Lure are informative and educational. These run daily during the summer months departing right from the marina/private beach areas. Plus the quaint shops and attractions of Chimney Rock Village are a short distance away.